we love this quilt. now that winter is gone we needed a thinner blanket and our new puppy ate our beloved quilt. so we saw this and went out on a limb. so glad we did. it is more than big enough for a queen bed. it drapes very nicely over the edges and it's very long so you can do a nice hotel tuck in the pillows and still get a nice matching drape at the foot of the bed. the stitching appears to be well done. the patches are nice and uniform. the border aligns nicely with the mattress. thus is a great buy at a really great price point for a quilted blanket. Truly beautiful. Be aware that the comforter is quite long. Although I have a queen size bed, I ordered the full comforter. It is a perfect fit and hangs as it should! Extremely happy with this purchase! I bought this on sale for less than *** and paired with the matching shams and throw pillow it looks great on my bronze metal bed. The spread has a wonderful drape and is a good weight - not too heavy, but substantial. There is more sage green in this than I had expected, but its not unattractive and balances out the brown tones. Very pleased with this purchase! Bedspread is very pretty. Looks great. Did find it to be extra long however, having to tuck it under the pillows more than usual when made bed so doesn't drag on floor. Despite that little factor, am still happy it. Get many compliments. Ordered this for an extra bedroom. I was so pleased at the quality. It has good color and the design is quaint. It has the exact look that I was looking for. Old fashion and cottage look. I would have rated this 5 stars if it was as the photo shows, but the middle design border does not stop at the edge of the bed, it extends over the sides about 2 inches on both sides and the end, and my preference would have been as the photo shows. 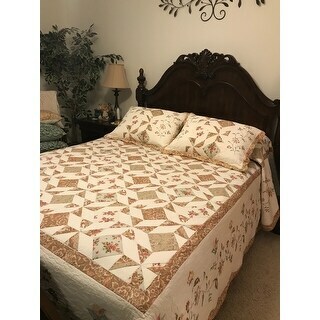 Beautiful quilt and actually sized to fit queen bed. This is a beautiful quilt. The colors are as shown. The quality is very nice. The only reason I did not give 5 stars is because when I opened it up, it had a very strong chemical smell. Very happy with the quality of this bedspread and even prettier then picture. Heavier material not a summer cover but chillier temps. Beautiful! Great quality. Looks wonderful with shams. Love it. Looks better than expected. This is a very nice quilt. It is actually larger than expected. It is easy to clean and has kept its appearance after several washings. Finally moved into our new home and was able to finish the bedroom. these are lovely and lightweight. very happy with them. I had been looking all over in my area for a bedspread with pillow shams and just couldn’t find one that I liked or that was reasonably priced. I decided to try on line and was quite pleased when I found this one. It is for a guest room and I just love it. It arrived very quick after I placed the order. It is beautiful and made very well. This is beautiful and the size of the drop was perfect. The only thing I wasn't expecting for a quilt is it is heavy. It looks beautiful and I would recommend it to a friend. I bought both the bedspread and the shams and love them both. It's difficult to find a actual spread any more and it's great! Material is very nice and the embroidery is very pretty! Beautiful bedspread. High quality/great value. I love it. The quality is very good. The colors are perfect. "Under Product "Details" the King size is listed as 110" X 92". But under the Q & A the King size is given the dimensions of 120" X 118". That is quite a difference. Would someone please verify the true dimensions?" "What are the measurements for the King Bedspread?" The measurements for the King size are 120 inches W x 118 inches L.
"Is the Gracewood Hollow Reg Cream Bedspread available for Queen size bed?" "Gracewood Hollow cream bedspread I- Is this available in Queen?" "How do I order the matching shams for this bedspread?" "What are the measurements on the Queen size?" I don't know. Mine is King size. Don't remember the exact measurements only that it was way too big for my (high) queen mattress. Gave it to my daughter for her king size bed and it fits perfectly.. It really is beautiful! "Where do I find the matching pillows?" Matching pillows are not available.